And who, I hear you ask, is the Abraham Lincoln of Irish gays? 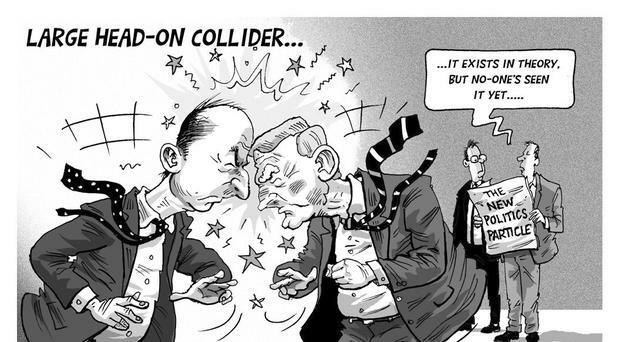 Is it Enda Kenny or is it Micheal Martin? A week after the election I said that if Fine Gael and Fianna Fail played their cards right both parties would continue to assert themselves over the next two election cycles and would remain, for our lifetime, the dominant forces in politics. It was my Joe McHugh moment. Now that Leo Varadkar has been moved out of Health, he's going to have more time on his hands, so he's agreed to write a weekly column of his musings on things for the Sunday Independent. Here is his first, and possibly only, column. 'If you take too long churning the butter, you get bad butter," declared Mattie McGrath. In 1977, my mother's friend - let's call her Mrs Malone - had accumulated the £156 that she would need shortly to pay her annual housing rates. Initially, the rural TD thought a colleague was winding him up. The Healy-Rae brothers, Michael and Danny, have taken different stances on the prospect of backing a minority coalition led by Fine Gael with Enda Kenny as Taoiseach. Fine Gael is now putting power over principle and their own careers first. This is no grand coalition, it's FF sponsoring its traditional enemy and hiding behind any sense of responsibility. When Enda Kenny bounced into the meeting with junior ministers on Tuesday evening they knew everything was okay with the world again. So who now says it is still better having Fine Gael and Fianna Fáil playing footsie with the future of the country's water supplies, rather than having another general election? The push is on to get Enda Kenny re-elected as Taoiseach next Wednesday - but don't bet on it just yet. So the "bould Leo" retreats from the negotiations telling us the deal he helped craft is inimical to the citizens' interests. Q & A: Who will ultimately pick up the tab for the cost of political deal on suspension of water charges? What is the deal on Irish Water and water charges? Over the weekend, Enda Kenny received a text message from one of his most loyal supporters. On what was almost certain to be his last speech to the Dáil as minister, an embittered AK47 opened fire on his colleagues with a water pistol. Micheál Martin is good at strutting when the occasion arises - but yesterday at Leinster House he set a new standard in walking tall. Eoin O'Malley: What does SF do when its day just won't come? Way, way back, when I was more easily excited about these things, a newspaper gravely reported the discovery of "a new erogenous zone". Boy, were we feverish. 'My name is Gerry and I'm opposed to things", was the opening line of Oliver Callan's recent priceless Opposition Anonymous sketch. And so he is. Which is the bigger prize - being in government or being able to say you are responsible for the demise of water charges? The Dáil sat for seven hours yesterday, and our TDs had plenty to say. Eight things we learned on the campaign trail.